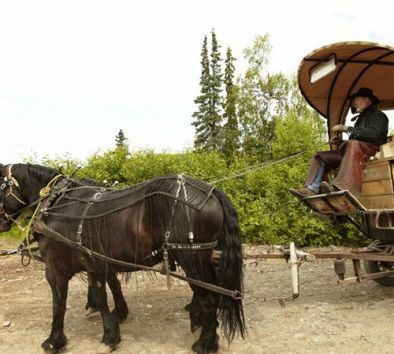 Discover Alaska the way pioneers and gold prospectors did back in the days—by a horse-drawn covered wagon! The excitement begins when the wagon picks you up right outside the Mt. McKinley Princess Wilderness Lodge. Climb onboard and meet the beautiful teams of horses that will take you on a pleasant, unhurried journey offering exceptional views of Denali (formerly Mt. McKinley), the surrounding peaks and glaciers of the Alaska Range. As you ride into the wilderness, immerse yourself in the rugged and tranquil wonders of nature and keep your eyes open for wildlife that inhabit the area such as foxes, martens, lynx, hawks and golden eagles. Next, you’ll stop for a chance to stretch your legs, sit around an old-fashioned campfire, roast S’mores and learn about Alaskan geology and history. Your guide will share stories about the gold rush days of the 1870s. You’ll even get the chance to strike it rich by panning for a little gold yourself. Dress in warm layers. Children under 5 are free. Blankets will be provided. Wildlife sightings are likely but are not guaranteed. Tour will operate rain or shine. Tour operates subject to meeting a minimum number of participants. Time on wagon is approximately 2 hours.